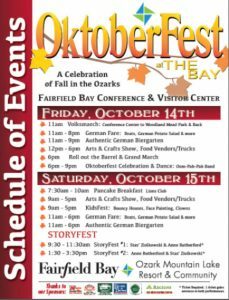 Don your best lederhosen and dirndls, bring a hearty appetite and join Fairfield Bay on October 14-15 to welcome Fall to the Ozarks with a traditional OktoberFest, and StoryFest, a celebration of professional storytelling. 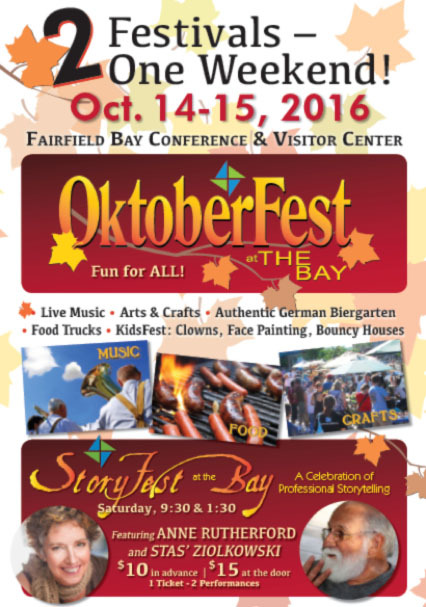 “People from all over have told us how much they love bringing in the fall season by celebrating the traditional OktoberFest,” said Fairfield Bay Mayor Paul Wellenberger. “And the family fun really takes an authentic twist with one of the Bay’s most unique events, StoryFest. Visitors to OktoberFest will find a traditional German OktoberFest celebration full of authentic German fare and Biergarten, a traditional Volksmarch, as well as music, arts, crafts, kidfest and so much more. Free and open to the public, OktoberFest begins at 11 a.m. on Friday, October 14 with a Volksmarch, a traditional German walk. Participants will begin the march at the OktoberFest grounds, wandering to Ed Leamon Park and back, with each “marcher” getting a walk memento. Local arts and crafts will be displayed for show and sale until 6 p.m. German food, food trucks, and music will go on all day, with a ‘Roll Out the Barrel’ Grand March at 6 pm to begin the evening’s celebration and dance. Saturday October 15th, the family festival opens at 7:30 a.m. with a Pancake Breakfast at the Lion’s Club Den. Arts and crafts will be on sale beginning at 9:00 am. StoryFest follows at 9:30 a.m. New this year is the KidFest, complete with clowns, bouncy houses and face painting. The festival concludes at 6pm after a full day of German Fare and activities. At the center of a traditional OktoberFest is a truly authentic German Biergarten and mouth-watering German fare, such as brats, German potato salad, and more. New this year are the many food trucks, offering a wide variety of fare. Open throughout the festival, the authentic German Biergarten boasts plenty of seating and room to dance. The Biergarten and food sales open Friday and Saturday at 11 a.m. and go well into the nighttime festivities. 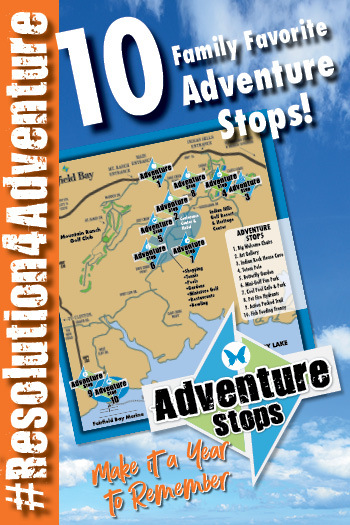 Along with OktoberFest, Fairfield Bay will be hosting the seventh annual StoryFest. A unique and truly memorable family experience, Fairfield Bay invites some of the best national story tellers to share their talents and bring a smile and laugh. Two Sessions: 9:30am and 1:30pm. Story teller sessions this year will feature Stas’ Ziolkowski and Anne Rutherford. Activities for StoryFest are suitable for any age and will captivate all. Morning story teller sessions begin at 9:30 a.m. Saturday, with the afternoon sessions begin at 1:30 p.m. All performances will be at the Fairfield Bay Conference and Visitor Center. Stas’ Ziolkowski started StoryFest in Fairfield Bay in 2010. Welcome home, Stas! In 2011, Stas was recognized by the National Storytelling Network and received the ORACLE Award for Service and Leadership. He will be performing: Heroes & Scoundrels, a Journey with Stas’, as he shares his wit through stories of the lessons of life. He draws on his life experience as a member of the US Army as a teenager, a soccer player, coach and referee, a track coach, organizer of large athletic events as well as theater and storytelling events, and of course being a son, a brother, a husband, a father, and a friend, to entertain audiences of all ages! For more on Ziolkowski, visit his website. Special thanks to all our sponsors. We could not have this event without them. Event Sponsors: Landry Insurance and Nestlehut Insurance & Financial Services. 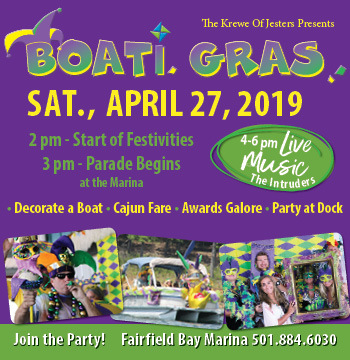 Corporate Sponsors: Noacon, Ozark Resort Homes, Goodwin & Herman Real Estate, Brown & Brown Insurance, Regions Bank, Red River Boating Center, and Petit Jean Electric. Why not stay for the weekend and get the most out of this family event? 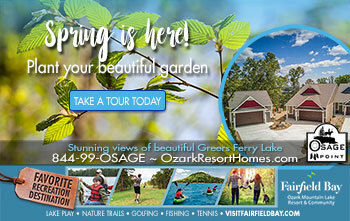 Come early to race and then spend the weekend exploring and playing in Fairfield Bay. For more information on vacation packages available, call a personal concierge to create a unique trip just for you at 501-884-4202.